The Leadership Challenge® is a research-based leadership development program that helps leaders mobilize others to want to get extraordinary things done. This highly accessible program approaches leadership as a measurable, learnable, and teachable set of behaviors. It is rooted in the belief that leaders, teams, and organizations improve when ordinary people enable those around them to achieve extraordinary things. 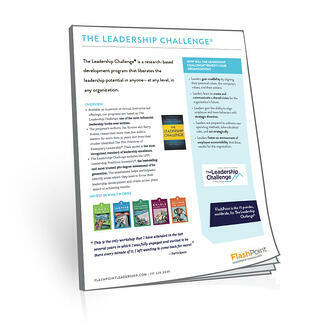 Developed from over 30 years of ongoing research, The Leadership Challenge® increases the leadership potential of anyone, at any level, and in any organization. It is a full suite of training programs, assessments, and coaching solutions, all designed to teach the behaviors that are proven to increase leadership results. Fill out the form to download an overview of the program. We’ll send you a copy by email.